On the evening of June 7th, 1857, a hastily-assembled squad of Vigilance Committee volunteers grabbed their weapons and hurried down to the waterfront. The wharves of San Francisco were busy that summer. Ships were arriving with passengers and goods from all over the world. 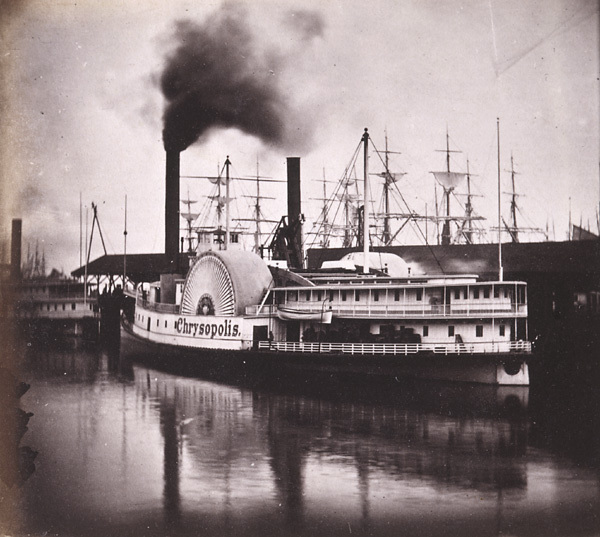 Clipper ships and Trans-Pacific steamers came from distant ports: New York, Britain, Germany, Hong Kong, Singapore. The brig Jupiter was in from Costa Rica, as were the Bonita from Manila, the Diana from Bangkok, and the Colorado from Tahiti. More schooners sailed in from Guaymas, the Society Islands, and Manzanillo, along with forty-two “coasters” plying the Pacific shore. The Vigilantes hurried to the Battery street wharf, where the three-masted German bark Wilhelmina had put in a few hours before. There was a rumor that in the course of her long trip “around the horn” from the European port Le Havre, the Wilhemina had stopped briefly in Guatemala, where she picked up a certain Mike Brannigan, bound for San Francisco. Just a year earlier, the Vigilance Committee had banished Brannigan from the city on pain of death. Brannigan had been exiled for being “a man of very bad character;” he had once bitten off a cabdriver’s nose, and had horse-whipped a woman across the face in the middle of Washington street. He was the kind of guy who snuck into burning buildings to see what he could steal. But most importantly for the Vigilantes, he had been a “shoulder-striker:” a political enforcer and ballot-box stuffer working for the Democratic party. The San Francisco papers had followed Mike’s tumultuous return trip through Nicaragua, but had reported him vanished along with smuggler and fellow exile Chris Lilly, whose fate at that time was still unknown. But now Mike was back in San Francisco, thumbing his nose at the Committee of Vigilance. He would have to pay. 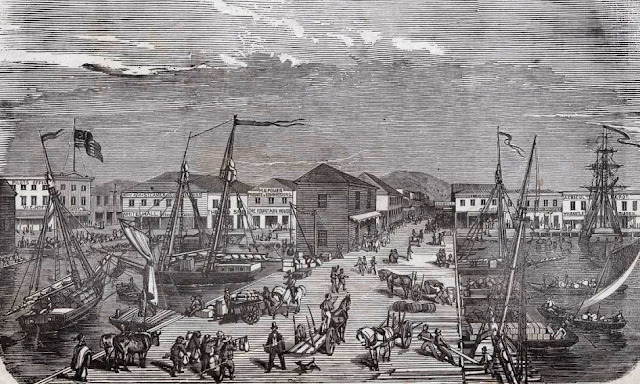 But by the time the Vigilantes stormed the wharf to arrest Brannigan, “the bird,” as the Chronicle lamented, “had already flown.” Without stepping off the docks onto the soil, Mike had hired a waterfront boat and fled across the bay to Benicia, where he boarded a river steamer bound for the safer, anti-Vigilante city of Sacramento. Mike is a rather small, strongly built man, with a short, curly beard, and a mean, ugly mug. He is naturally nervous, and keeps moving all the time he speaks. He is also what the “b’hoys” would call a pretty good blower, and talked straight along concerning himself for over an hour. Concerning himself, Mike insists that his character was always good in San Francisco, and that the Vigilance Committee did not give him a trial, or he would have proved this by their own members. ... He now intends to carry on his business in Sacramento; and he swore the Vigilance Committee would have a merry time if they attempted to take him; and that it could not be done without loss of life. Sacramento was a safe place for Mike—it was controlled by opponents of the Vigilance Committee, who called themselves the “law and order” faction. In Sacramento Mike’s political connections still protected him. He acquired a fine carriage, and started back on his old trade of cabdriving. 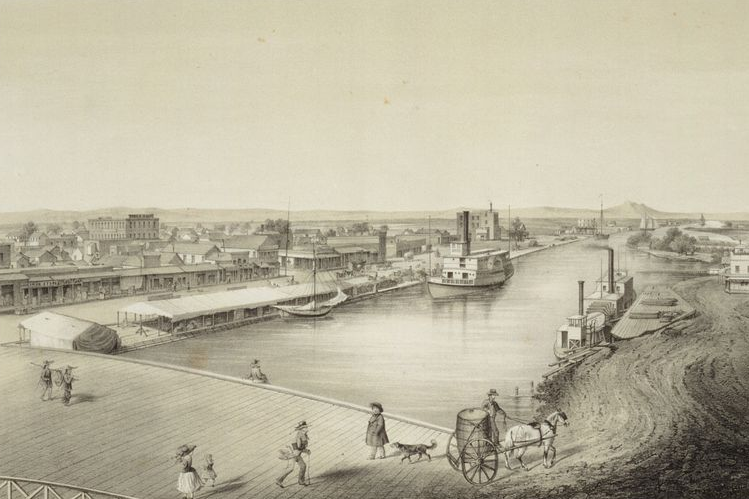 Stockton, California in 1858. Detail of a lithograph by Eugene Camerer (Online Archive of California). “This is a ‘law and order’ town,” said Mike, “and a gentleman can here have satisfaction out of the cowardly Vigilantes.” Presently, Mike got too noisy—so he was pounced upon by a constable, and marched off to the calaboose—and this in spite of his pertinacious declaration that he was a “law and order man,” and that he “always thought that Stockton was a law and order town!” Next morning Mike was arraigned before a Squire, on a charge of being noisy and disorderly. He denied being guilty, and claimed a jury trial. A jury was summoned—composed of Simon Pure “law and order men,” who patiently heard the evidence, and found that Mike was guilty! He was sentenced to pay a fine of thirty dollars, and to ten days imprisonment; and now lies in durance vile, which will continue for six days. I fear he will be at least a “day after the fair,” with his coach. And so Mike spent the week of the fair in jail, and made no money from his trip to Stockton. Yesterday Michael Brannigan, neatly dressed in his best “Sunday-go-to-meetins,” might have been seen, and was seen, on our public streets, shaking hands with his friends, and bidding a final adieu to Sacramento. The recent rescinding action of the Executive Committee of Vigilance, has enabled him once more to return to San Francisco, the field of his glory. While in this city, it is but justice to say that he behaved himself with tolerable propriety. With the exception of having been once before the Recorder for running a hack without license, we are not aware that he was charged with any public offense requiring judicial chastisement. May his future life be as free from reproach, and at death, the biography of Michael present some bright page worthy the admiration of posterity! Mike Brannigan, one of the exiles of the Vigilance Committee, taking advantage of the late action of the Executive Committee, has returned to this city. He was sent away in July, a year ago, and went to New York, where his banished companions made him up a sum of money and induced him to reëmbark for California on one of the Nicaragua steamers. On the passage he lost all his money, and on reaching Nicaragua he was compelled to remain there. After a while he strayed off into Guatemala, with Chris. Lilly, and succeeded in getting a passage on a vessel to this country. He was hurried off to Sacramento by his friends, and now returns to this city a “sadder and wiser, if not a better man.” Mike is well known to our old citizens as one of the pioneer hackmen. He will be tolerated just so long as he behaves himself. But this was not to be Mike’s triumphant return to San Francisco. Within a month, he had decided to go back to Sacramento. Perhaps things were still a bit too hot, and memories too raw, in the City by the Bay. Sacramento Sentinel: Returned—Mike Branigan, after a short sojourn at San Francisco, has come to the conclusion that there is no place like Sacramento, and has again become a resident of our city. And so Mike’s daring return ended with an anti-climax. He went back to cabdriving, but had traded San Francisco for the much less exciting city of Sacramento. It may have seemed that the new “sadder and wiser” Mike Brannigan was finally calming down. But Mike’s darkest hours, and his vilest deeds, were yet to come.